1. Soak all of the rice and various lentils (Pigeon peas = toor dal, Mungo beans = urad dal, Mung beans = moong dal) in water for at least 3 hours. 2. Once the mixture is completely soaked and softened, grind the cumin seed, ginger, crushed red pepper, and coconut with a handful of the soaked, softened rice lentil mixture. This process allows the spices to completely blend well. 3. Add the remaining rice/lentil mixture and grind it all into a smooth batter using a food processor. As you blend this mixture, you will need to add water, to ensure that the batter doesn't get too thick. You will want the batter to be slightly thicker than pancake batter. 4. Once the batter is almost done, add the turmeric and salt. Grind again to mix these spices throughout the batter. 5. Transfer the entire mixture to a large mixing bowl and add the chopped onions, curry leaves and cilantro. Mix well. 6. Heat the waffle maker to high, and spray both sides with olive oil cooking spray. Pour a ladle of the batter onto the waffle maker, and spread across. Close the waffle maker and flip, as you would make regular waffles. 7. 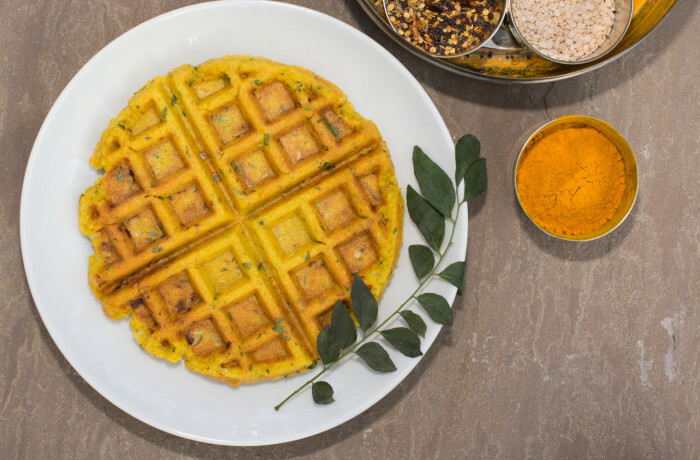 Remove from the waffle maker and serve with coconut chutney or even ketchup!